Chicken breast, half a kilo. Onion, carrot and tomatoes, one of each sliced or diced. Fresh parsley, 1 tbsp., chopped. 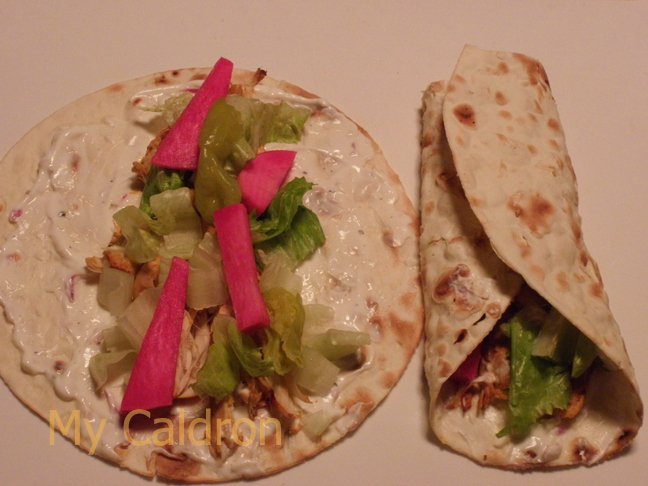 Small round Pita bread, or any other similar flat bread, 2-3 for each person. For sauce: Garlic, 2 cloves, grated. Onion, ¼ of a medium onion, grated. Greek yogurt, 5 tbsp. salt and black pepper. 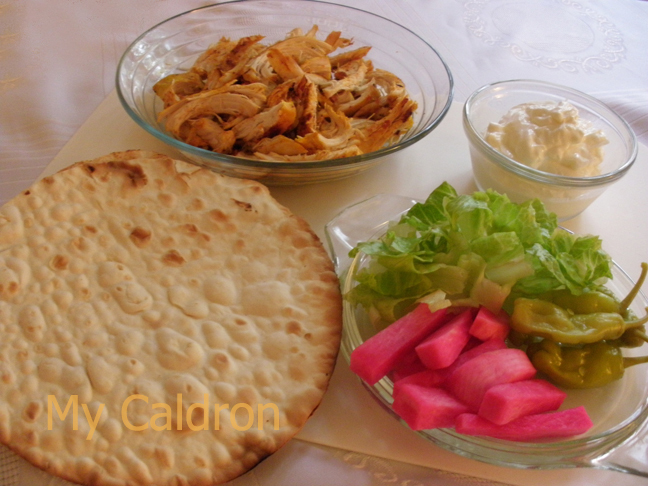 Method: You could roast, grill or skewer and barbecue the chicken breast – whichever is your popular method. If you go with grill and barbecue, make sure to cut into cubes and marinate in a mixture of chopped onions, garlic, added to olive oil, lime juice, salt and pepper for a few hours. Here is how I prepare my roasted chicken though: Place chicken breast in the bottom of a medium pot over sliced onions and carrots. Ann turmeric, salt and pepper and simmer with very low heat for an over. No water is needed, as the vegetables produce sufficient liquid for the breast to be cooked to core. Once cooked, Remove lid and tope breast with diced tomato and chopped parsley and shred with a fork over medium heat. Once the juice is absorbed the breast shreds are ready to go in to the sandwich. For sauce: Simply mix garlic and onion, salt and pepper with yogurt and spread on the bread. The white sauce could be replaced with hummus. Then, all you need to do is assemble the sandwich with the toppings of your choice. And listen to this amazing music! Bon Appétit and enjoy! !